I shared with my former composition teacher C. Curtis-Smith a mutual fondness and admiration for Bach’s Goldberg Variations. After my studies with Curtis-Smith at Western Michigan University from 2001 to 2003, I decided to make what I thought would be an interesting, if not entirely practical, arrangement of the Goldberg. I must have been inspired by learning that 13 new variations were being commissioned by the 2004 Gilmore Keyboard Festival from 13 different composers including William Bolcom, David Del Tredici, Lukas Foss, Fred Lerdahl, Jennifer Higdon, Bright Sheng and Curtis-Smith. For my arrangement, which I completed during my 2004-05 year at the University of Iowa, I figured that with a 32-measure long structure and with 30 variations, I could include one measure from each variation and bookend the entire arrangement with the first and last measures of the theme. (Some variations are 16 measures, in which case I considered 32 half-measure units.) I was skeptical that I could make such an arrangement work out from a musical standpoint, but in the end I was surprised at how well it did work. It still has its awkward turns and transitions, but that was to be expected. I was also pleased that very few notes were changed in terms of octave displacement. I remember the process being a tedious one, especially with regard to dealing with the variations in minor. I also remember not being satisfied with the first attempt and having to scratch all but the opening few measures. Here it is. Listen to a midi realization here. A PDF version is available at http://www.lukedahn.net/Scores/EconomyGoldberg.pdf. The shift from measure 12 to 13 may be the most awkward transition in my estimation. Not only is there a shift from simple meters to compound, there is a harmonic awkwardness with the downbeat of m.13 suggesting a I6 chord while the remaining part of the measure projecting a pre-dominant (IV or ii) harmony. The awkwardness is created by the fact that measure 13 comes from Variation 3, the canon at the unison, which contains slight harmonic reorientations in order for the canon to work. 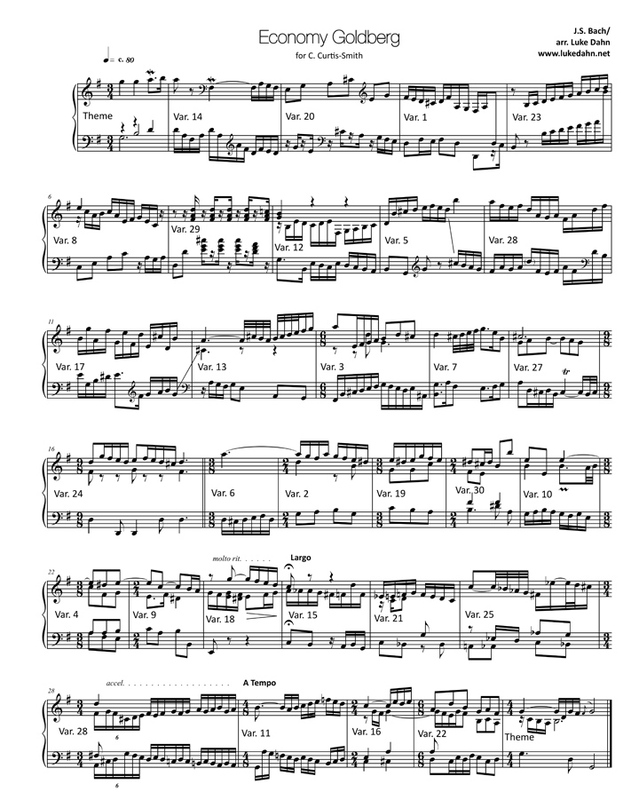 The alternation between 3/8 and 2/4 in measures 17 through 20 may not be the smoothest passage, though the complex-meter effect alleviates the awkwardness, as does the coincidental motivic imitation between m.17 bass and m.19 treble. Obviously the shift to minor at measure 25 is dramatic, but this couldn’t much be helped. The minor variations (15, 21 & 25) had to be lumped together in a very carefully placed position since many of the diatonic chords between D major and d minor are quite incompatible. (For example, the submediant is tonicized in measures 20 through 24, which means E minor when in D major and Eb major when in D minor.) I figured that a dominant sonority would provide the best way of exiting the minor mode segment since the V chord is the same in both modes. This entry was posted in Uncategorized and tagged bach, Composition, goldberg. Bookmark the permalink.